A few years ago some folks started asking the question, What Would Jesus Drive? I’m not sure how seriously the question was supposed to be taken, as it was part of a campaign to demonize SUVs and the gas-guzzling ways of the people who drive them, but author Richard Gasaway has recently offered his answer to this question, and I don’t think it matters what kind of car it is, as long as it is powered by hydrogen fuel cells. His book, An Inconvenient Purpose, approaches the environmental movement from the unique perspective of Christians seeking to act as stewards of God’s creation. He calls for the perceived conflict on this issue between left and right to be ignored in favor of doing what is right for the planet and what is right in God’s eyes, regardless of one’s political affiliation. I think this is an important point, and one that does not receive much attention. The debate is always framed in the media as left versus right, and those on the right, who have not taken the time to educate themselves, assume (wrongly) that because Al Gore advocates it, it must be wrong. The author does a great job in this book of appealing to this demographic, and laying out a case for stewardship that transcends politics. He covers all aspects of the movement, from pursuing alternative energy sources, to lessening our dependence on foreign energy for national security reasons, to the environmental impact of greenhouse gases and other pollutants. But he keeps coming back to hydrogen as the clean solution to our dirty addiction to oil — and that cleanliness is next to godliness. People talk of the inefficiency in creating hydrogen, and all the energy that must be expended to generate hydrogen molecules. However, people don’t think twice about the inefficiency of creating electricity from start to finish. The electricity arriving at the normal house outlet often contains only a third of the energy content that orginated in the coal from which it started. Factor in the incandescent bulb inefficiencies of a typical house lamp plugged into that outlet and you’re at about five percent. That is something to consider when criticizing an alternative energy — remove the beam from thine own eye before casting out the mote from thy brother’s eye. 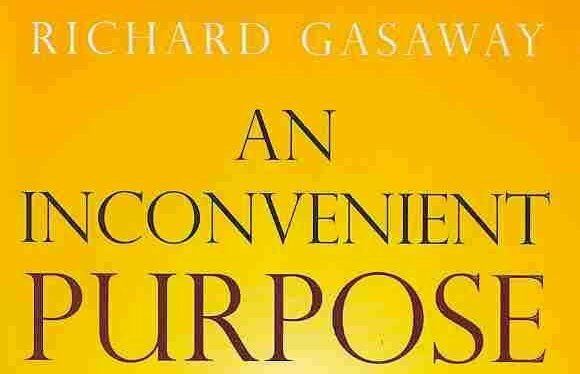 An Inconvenient Purpose carves out a well-defined niche for Christians in the environmental movement, and acknowledges their obligation to participate, it tackles the complicated issues involved in very accessible layman’s terms, all while offering an optimistic view of the future and the path we should all be following.